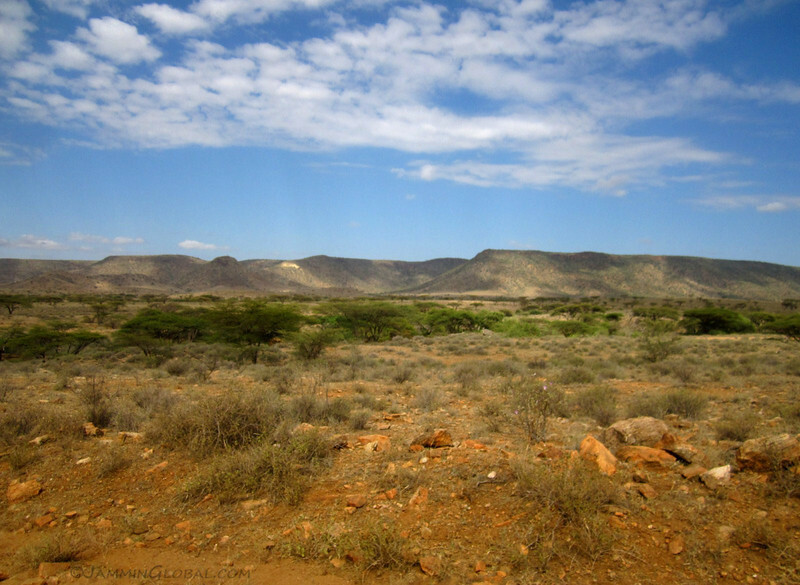 The journey down from Lake Turkana continued across the beautiful savannahs of northern Kenya, ending in Maralal, up on an escarpment. 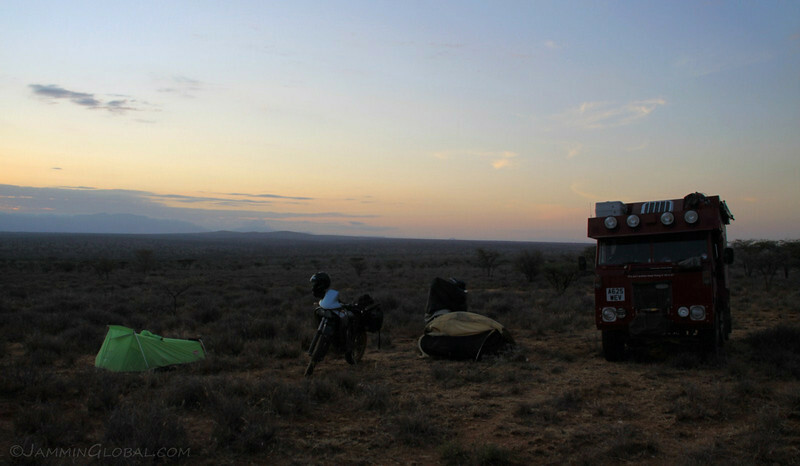 Our convoy had bush-camped a few nights on this trip but most of them were hurried as we rode right up to sunset. 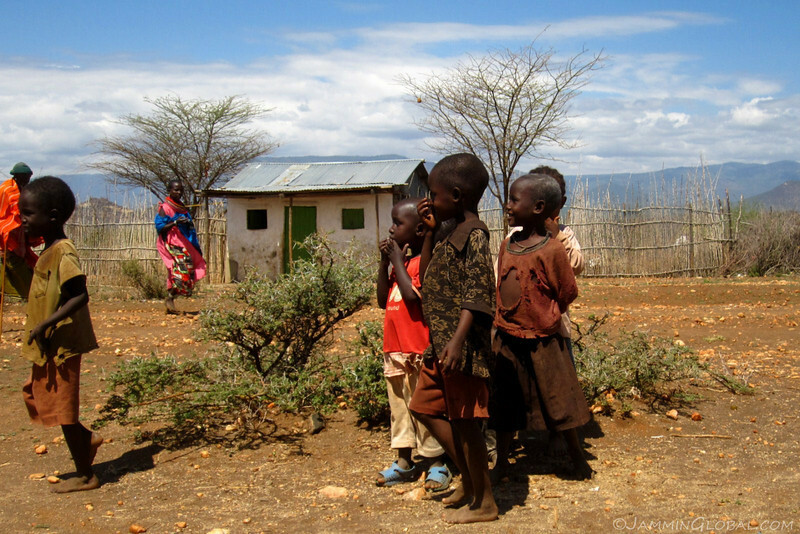 Now, with the convoy smaller and no party in a hurry to get to Nairobi, we had ourselves a memorable night of camping in the bush, just past the town of Baragoi. 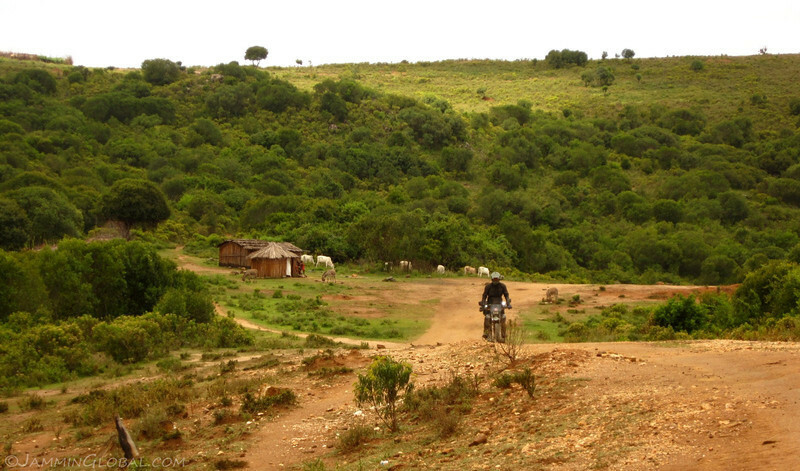 From there, we had one final tough ride up the mountainside to finish the route in Maralal. 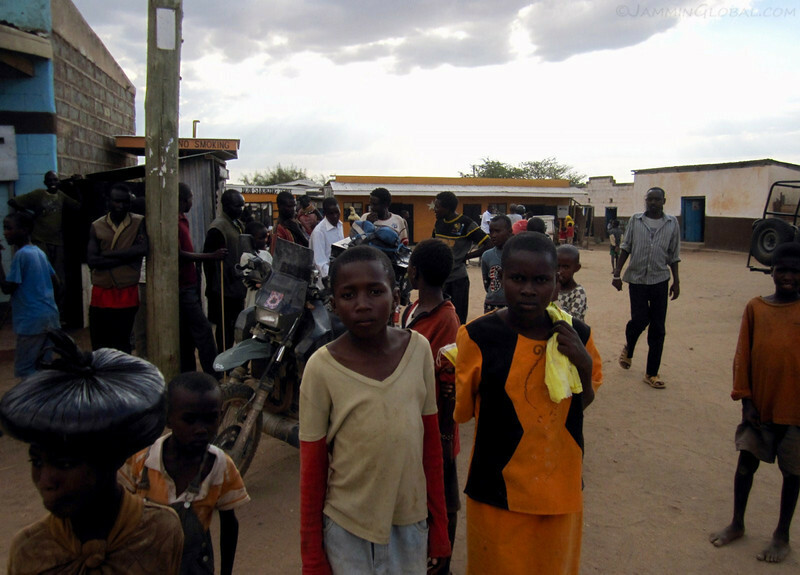 Riding into the town of Baragoi, the biggest town between Loyangalani on the lake and Maralal. 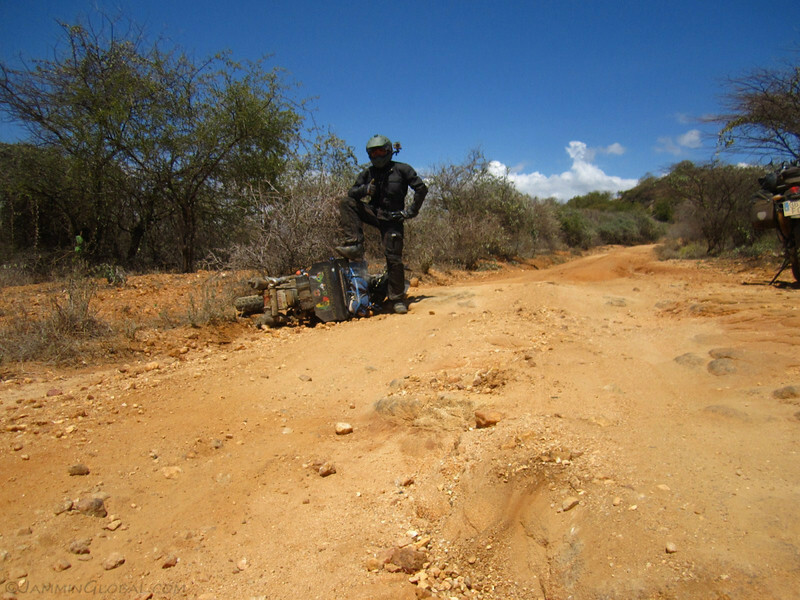 We didn’t expect to find petrol in Baragoi, but we topped up just in case. 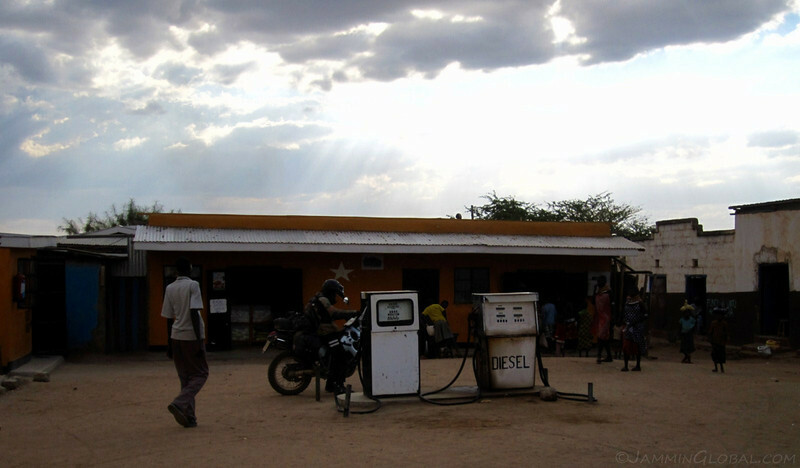 Fuel was slightly higher at KSh135/L ($5.49/gal) compared to the nationally-fixed price of KSh115/L ($4.68/gal). Of course, we were the most interesting thing to happen in town that day or maybe even that week, and we quickly drew a big crowd, but everyone was pleasant. …so Carlos pulled him up to sit on the tank. The others said his name was Baracka, named after Obama, and we figured he would be the most popular kid in town for a few days after this. 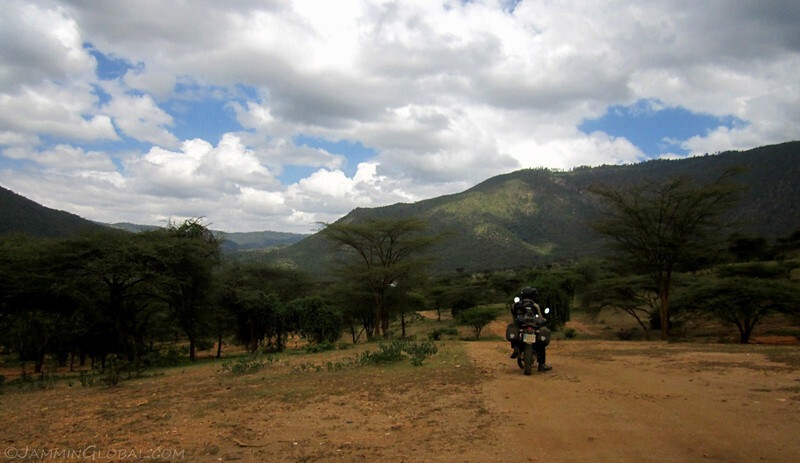 We rode a few kilometers out of town and came across Africa! 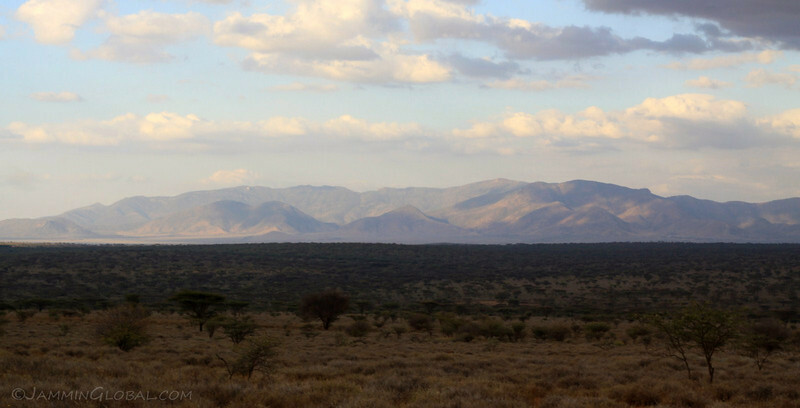 This was the most enigmatic landscape that I had ridden through – a huge valley with volcanoes dotting the landscape, the earth red and covered in acacias. We rode up this small dirt path to find a place to camp up on one side of the valley. 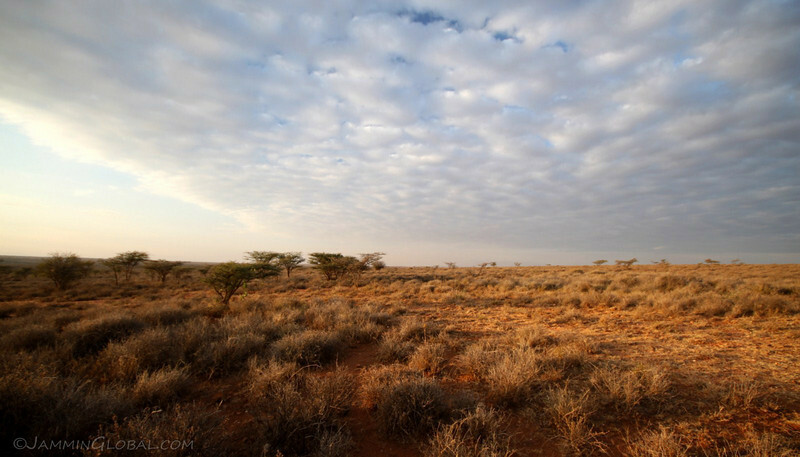 …with no signs of civilization around. 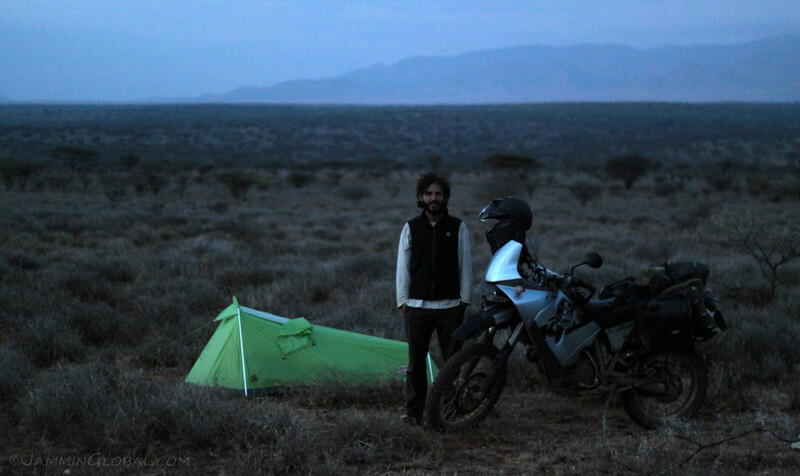 Carlos with his ride thru Africa, a KTM 640 and his shelter, a compact one-man tent. I enjoyed riding with Carlos. He was a kind soul and we shared many common interests. 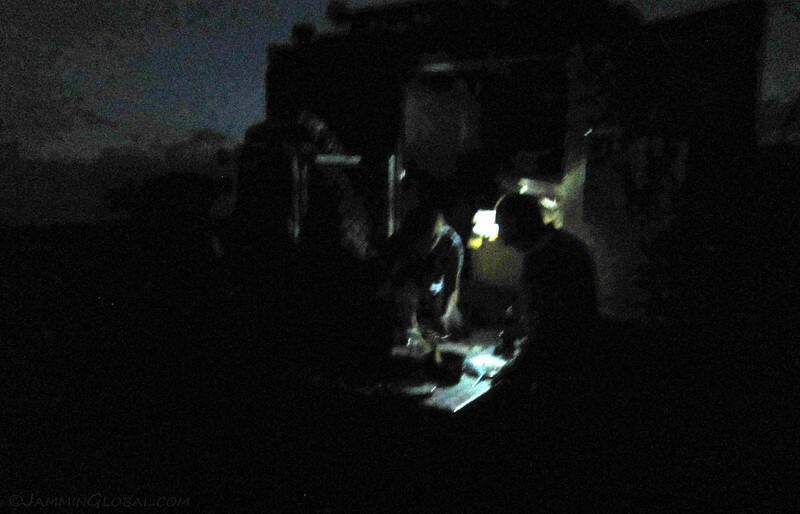 Peter and Jill provided dinner that evening and here they’re serving up rice with sausage and onion soup out the back of their Defender motorhome. After dinner, we watched the stars shining bright above us and I pointed out the Milky Way and the Southern Cross to my companions. Carlos, being a geek, pulled out his Android phone and launched his Google SkyMap app that when pointed at the night sky revealed star names and constellations. 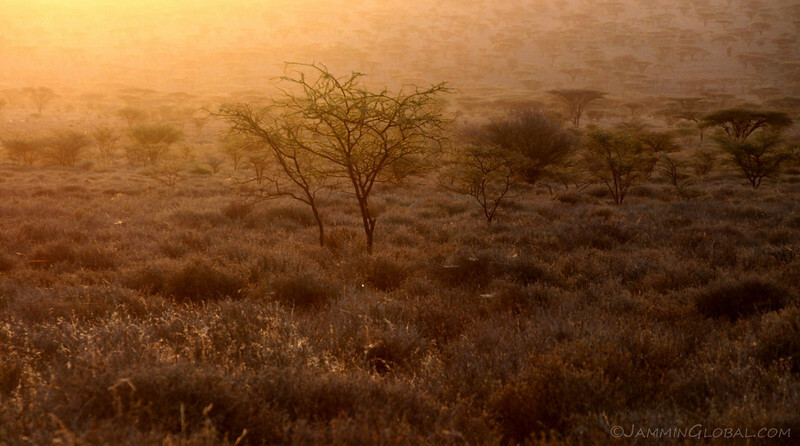 Just before sunrise on the African savannah. 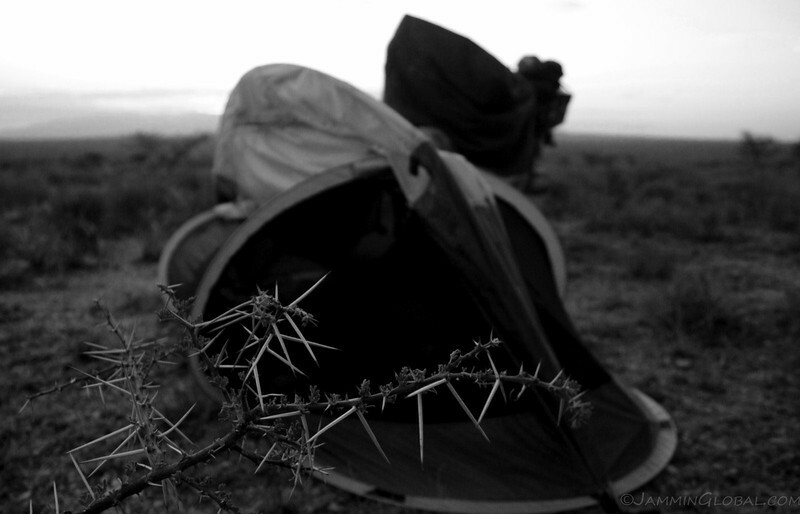 …but we found some open spaces to park our vehicles and tents. 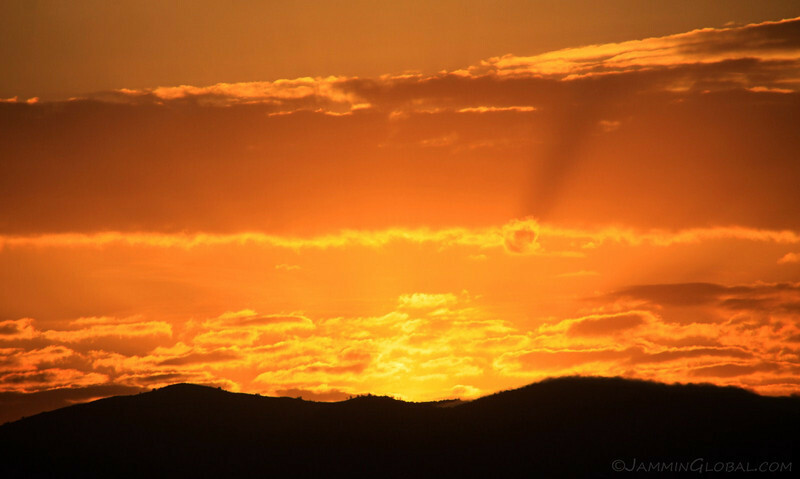 …the sun! 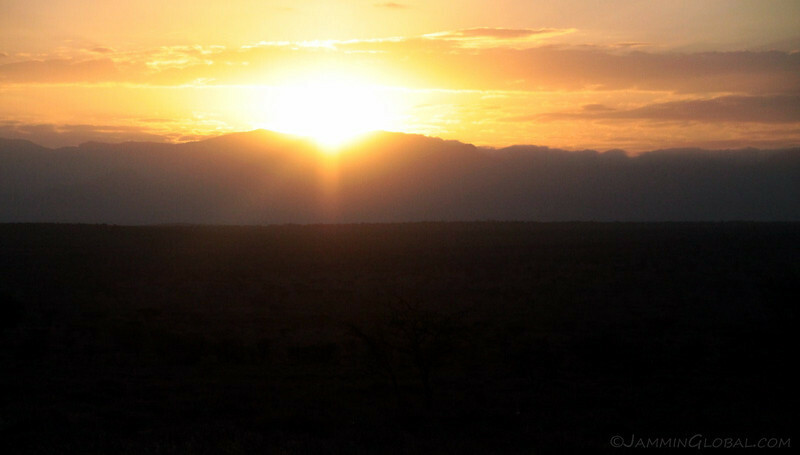 First rays touching all life in the valley and signaling a new day has begun. 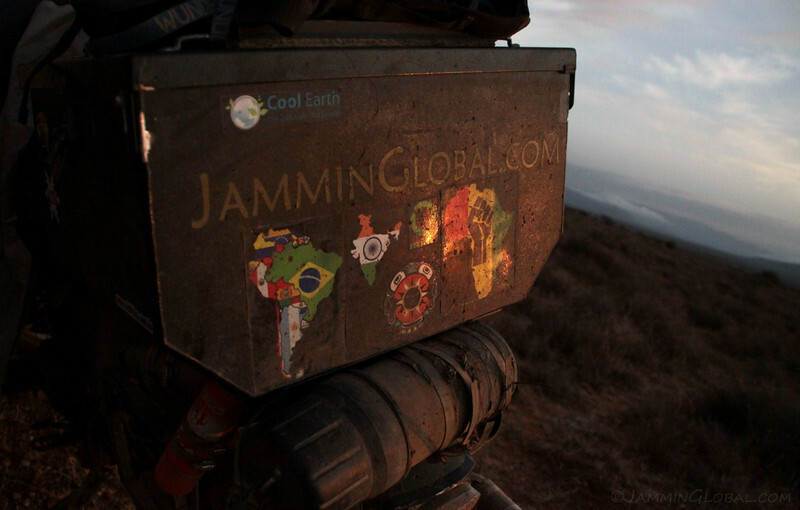 Catching the reflection of the first rays off my top box with stickers of the two major continents that I’m riding through, South America and Africa and a sticker of my destination, India. 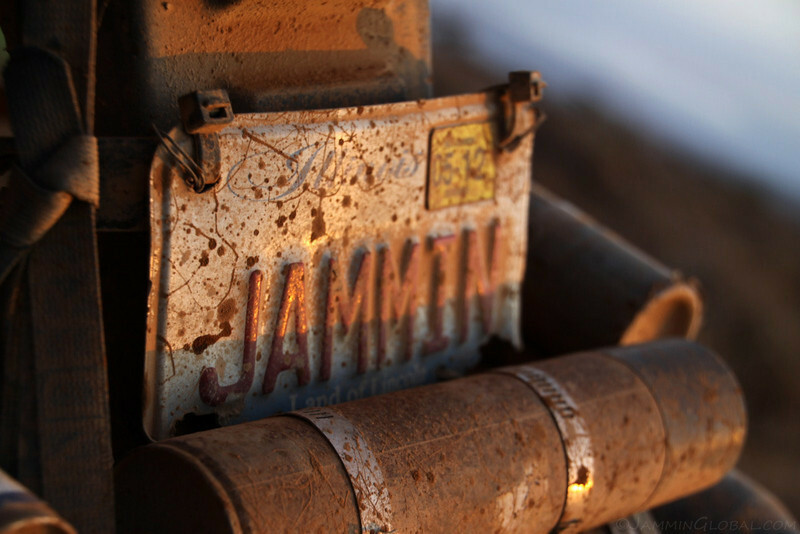 My license plate from Illinois, covered in dirt. I wondered if it would get stolen, but so far, nope. Mega zip ties and safety wire holding it on through all those vibrations. 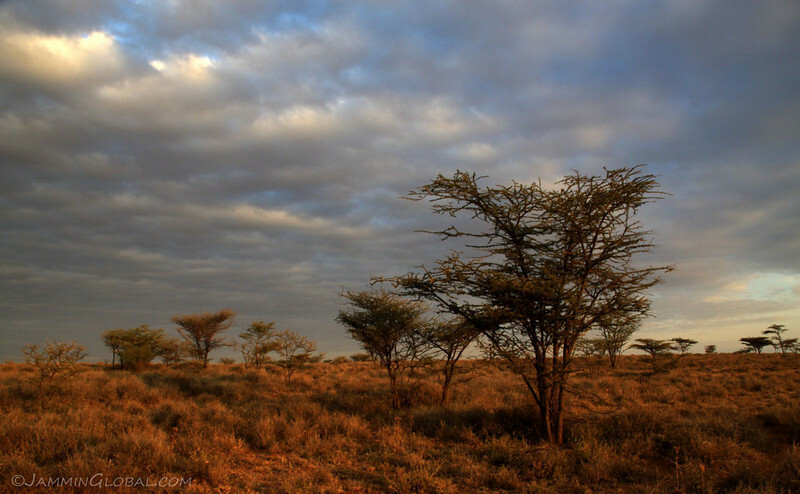 The savannahs of northern Kenya, covered in acacias, bathed in early morning rays. Feeling small and insignificant in this massive landscape. Truly humbling. 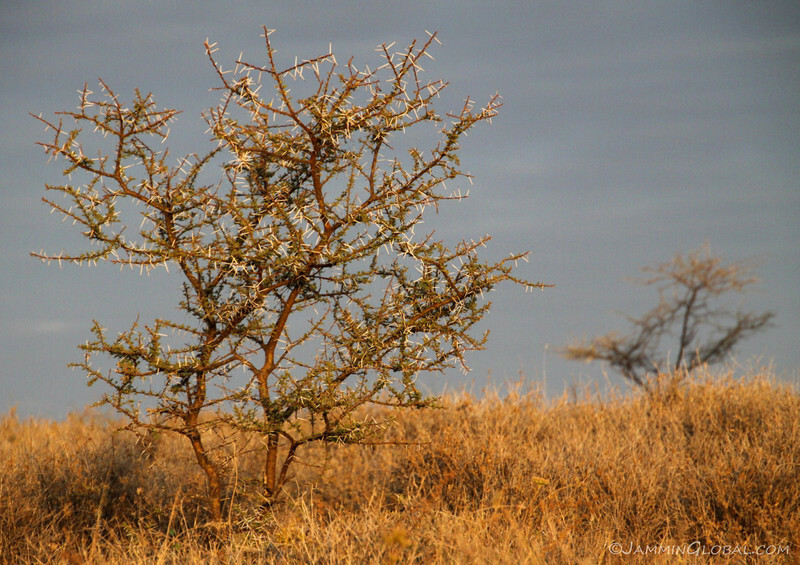 Magic light from the early morning sun lighting up the acacias. 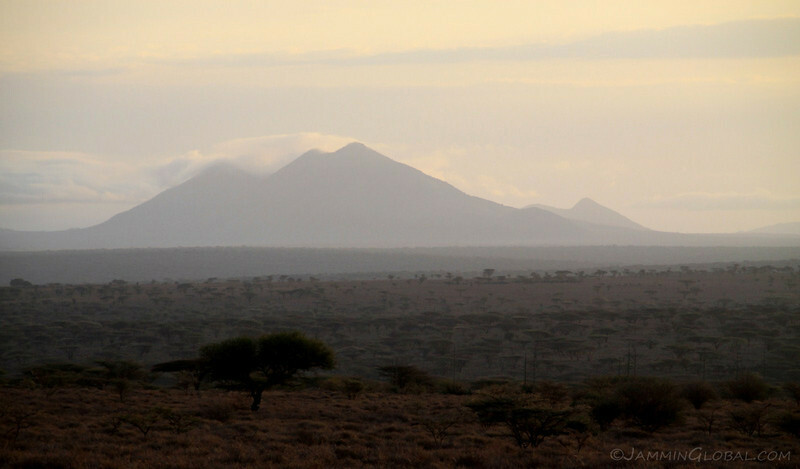 Volcanoes of the Great Rift Valley in Kenya. 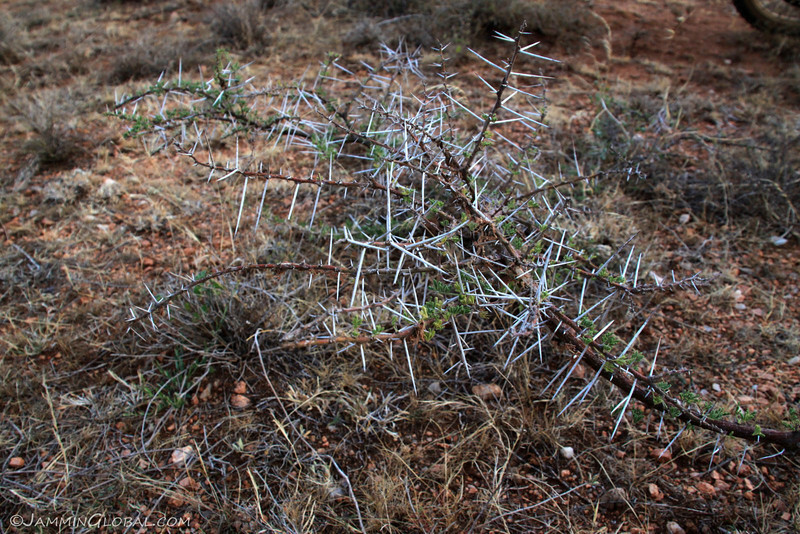 A thorny acacia, trying to defend what little leaves it has from all the herbivores in this land. 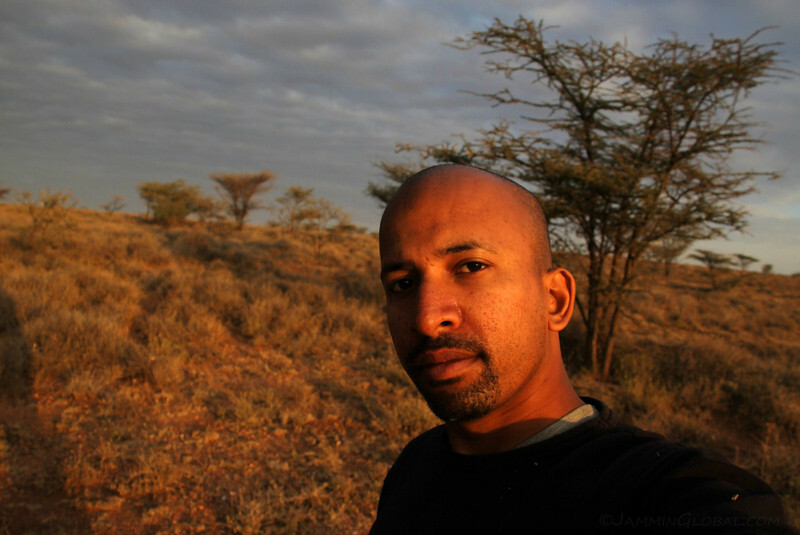 Enjoying a peaceful morning in the African bush and being thankful for getting the chance to ride on this journey and experiencing Mother Nature in all her beauty. 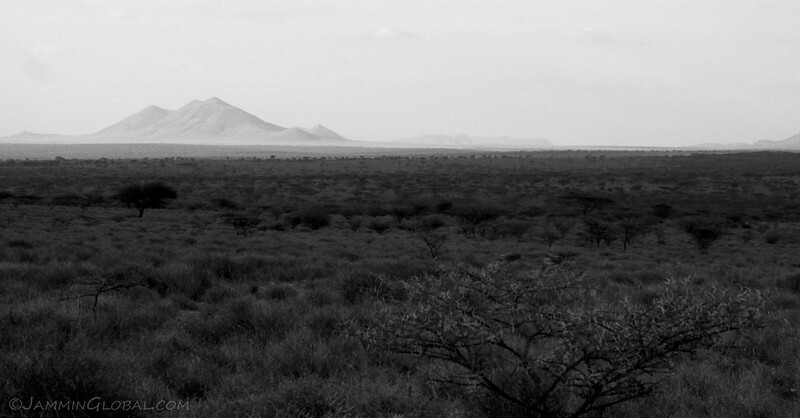 Looking south across the savannah and pondering about what lay ahead for us as we rode the last day on the Lake Turkana route. 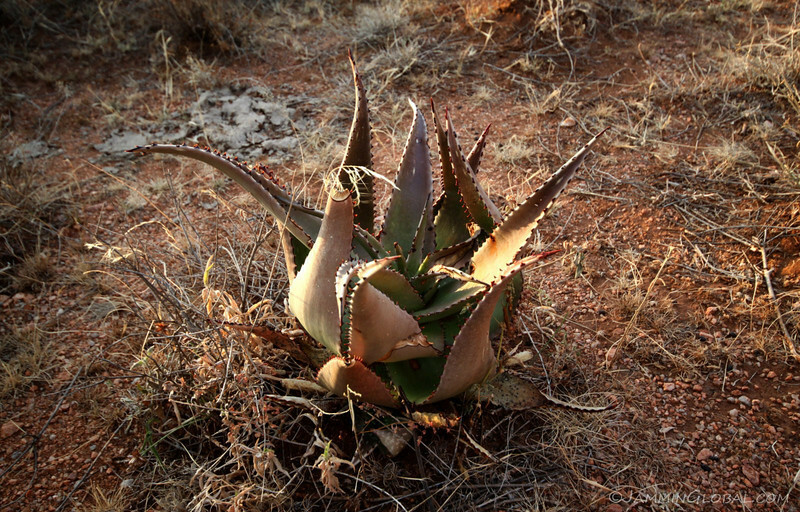 Cactus next to my tent. 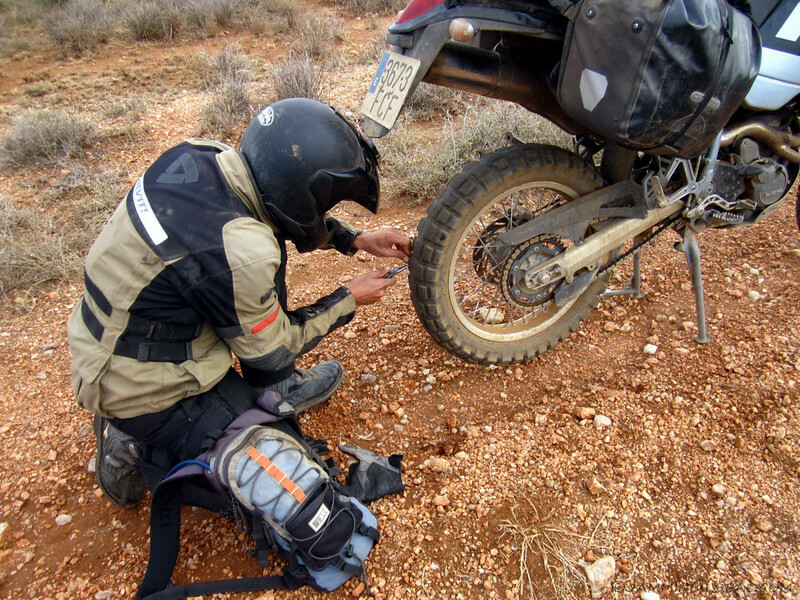 Carlos pulling out small thorns from his balding rear tire after we rode out of the bush. No worries on my Heidenaus. 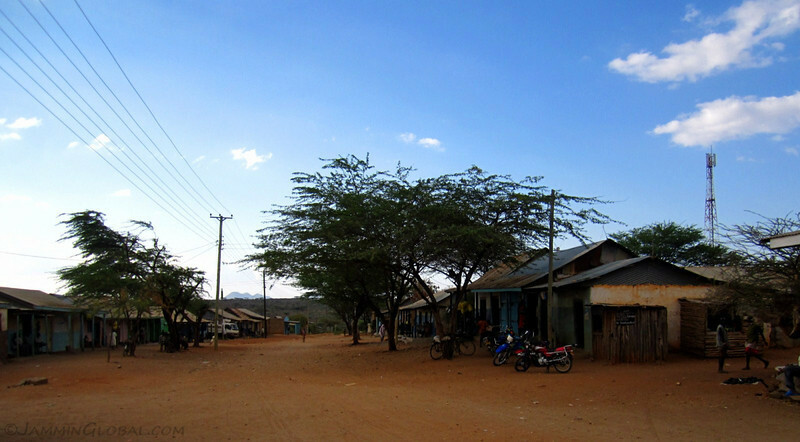 From Baragoi, there are two routes to Maralal. 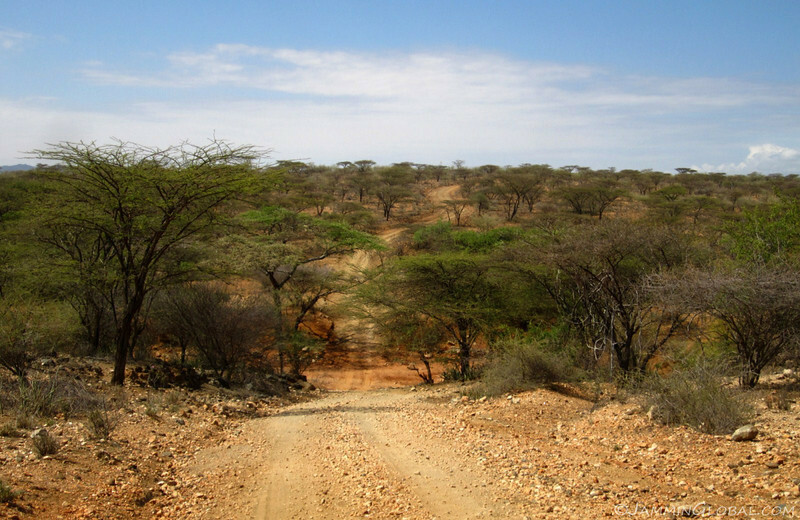 Peter and Jill took the main route, which they said was pretty rough with many water crossings and Carlos and I took the secondary route through Barsaloi, which had a very steep climb up from the savannah to Maralal on the mountain top. 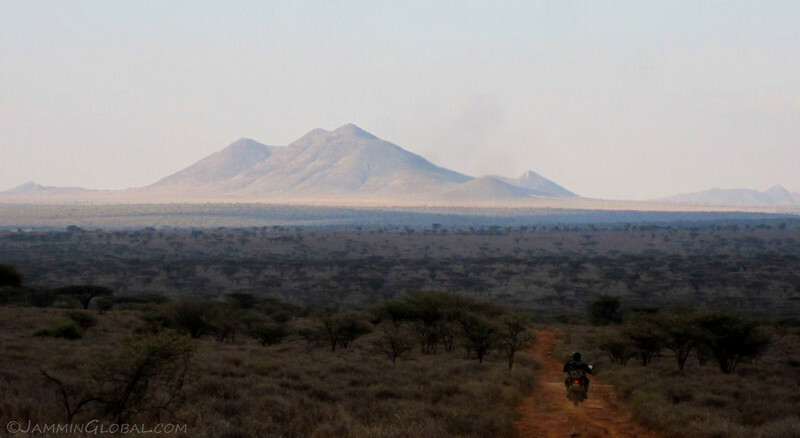 Enjoying the morning’s ride across northern Kenya’s bushland. 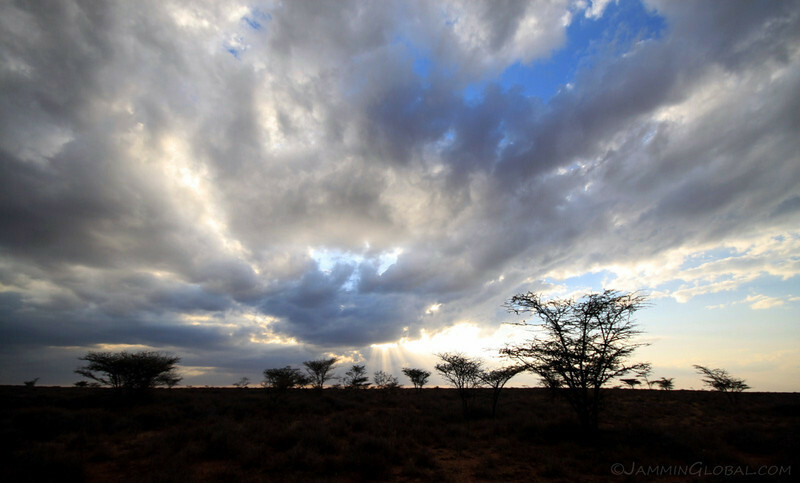 Beautiful light shining across the valleys and mountains of the wilderness in northern Kenya. 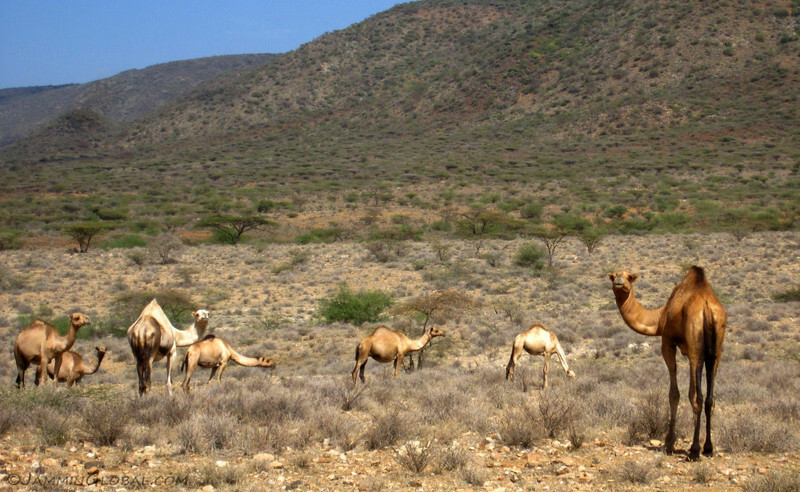 Camels grazing on whatever they can find in this parched valley. 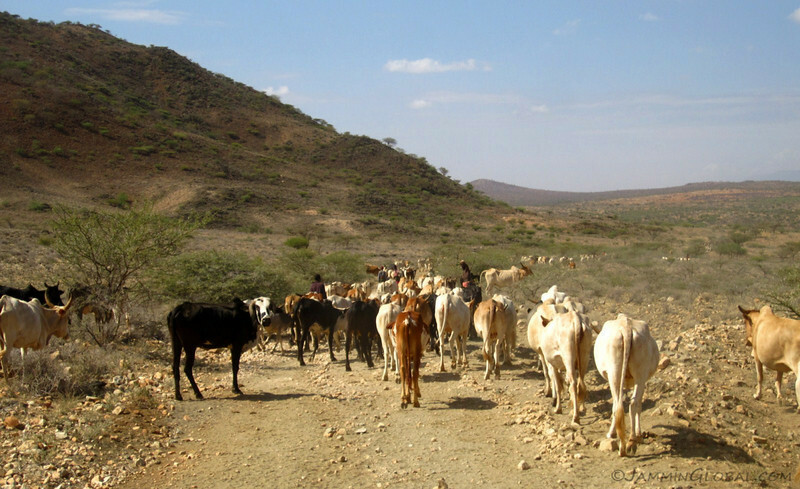 A long line of cattle walking in our direction. Uh oh, traffic jam in the bush. 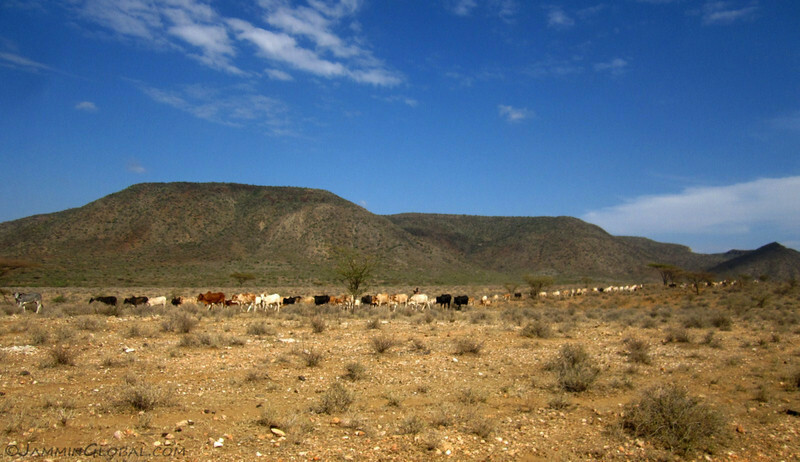 It felt like there were hundreds of cows and all were headed in our direction, so lots of honking ensued in trying to navigate through this sea of livestock. 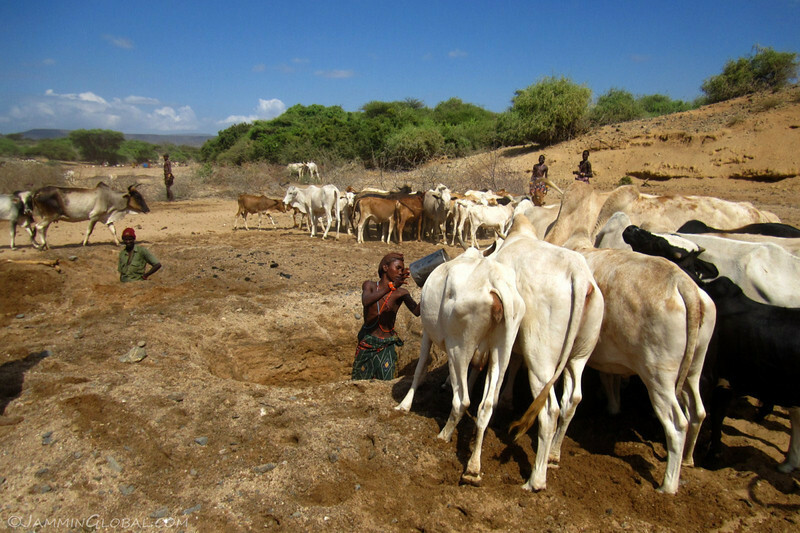 After surviving a 3 km sea of cattle, we saw what they were all coming for – their tribal herdsmen were digging wells in this dry riverbed and fetching water for their animals. …these were bigger and set in deeper valleys with steeper climbs on both sides. 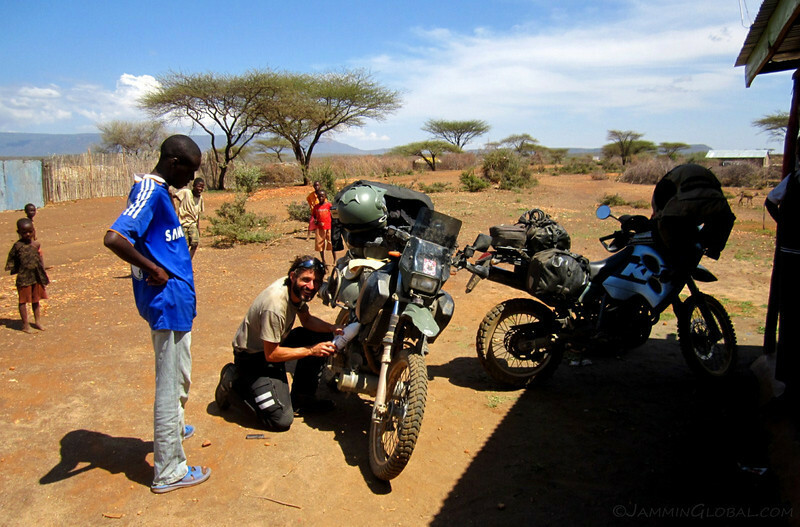 Carlos was waiting for me in Barsaloi and he had hit his fuel reserve again. Here he is getting a handout from sanDRina, the fuel tanker for KTMs, haha. 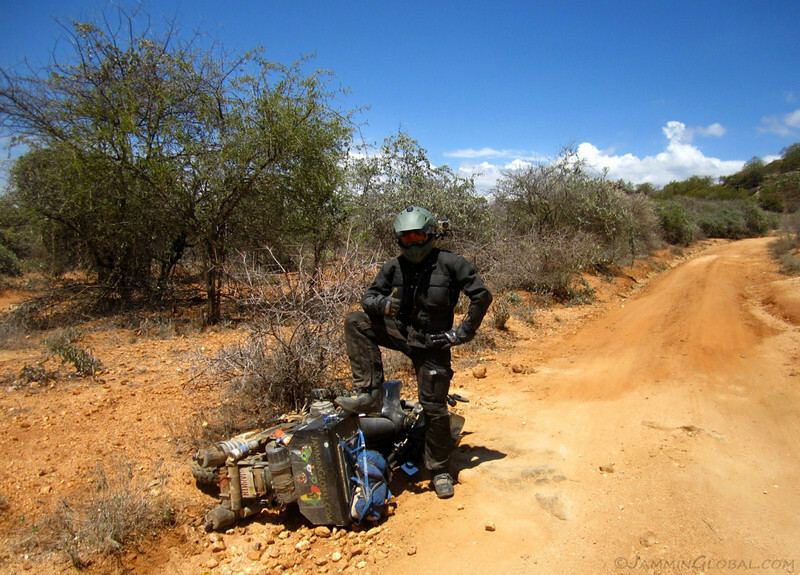 …my first real offroad crash. Don’t worry, no injuries to me or the bike. I quickly got up and Carlos captured this picture of me conquering the fall, not giving it a chance to bring me down. 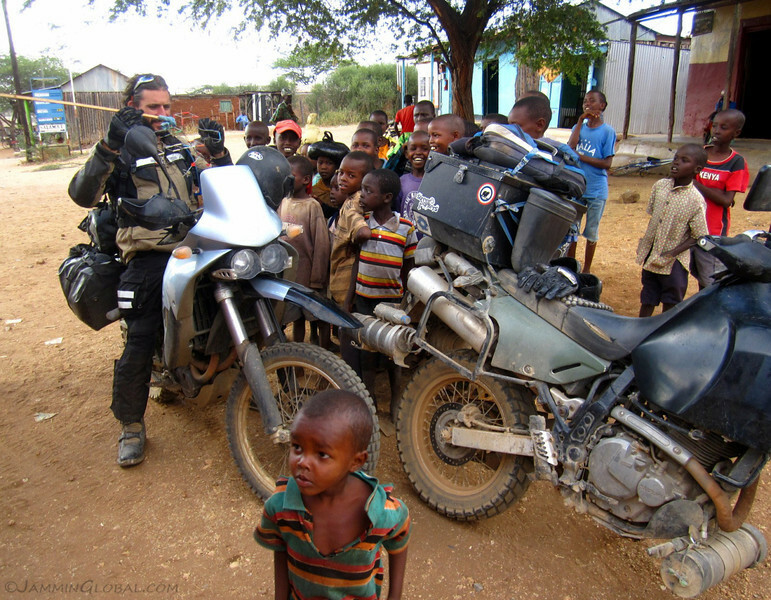 Then we quickly picked up sanDRina and checked for any damage, which was limited to just a few scratches on the plastic hand guards and the tank. She’s a tough girl. I was riding really good all morning and was charging up this hillside in second gear, making all the right calls for which path to choose, but this smooth rock in the foreground caught me off guard and I hesitated just for a second on deciding whether to go to the right of it, which would’ve been the better call, but then at the last second, I decided to go to the left of it and its smooth face caught the torque from the rear wheel and spun me out. My strong Oxtar TCX Comp motocross boots did their job in preventing any injuries to my feet and my Kevlar Motoport riding suit prevented any injuries to my skin. Teknic gloves did their job in preventing any injuries to my hand and my Arai helmet didn’t even touch the ground. 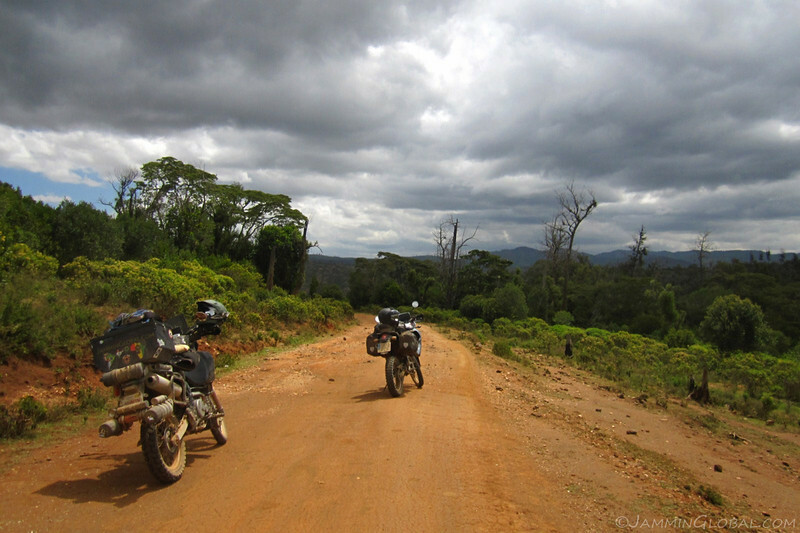 After a lunch break of bananas and Ethiopian peanut butter sandwiches, we rode on. 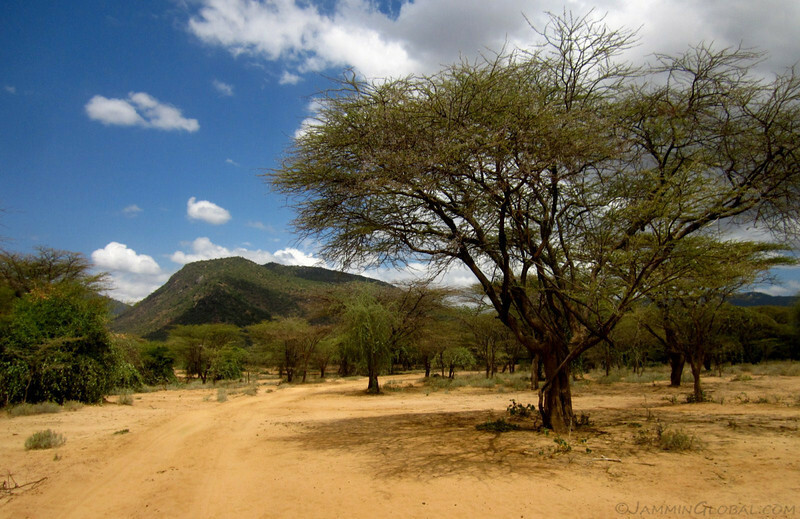 As we climbed higher toward Maralal, the trees got bigger but the ground was still sandy. More steep climbs out of dry riverbed crossings. Carlos waiting for me as he took in the view of the mountaintops. 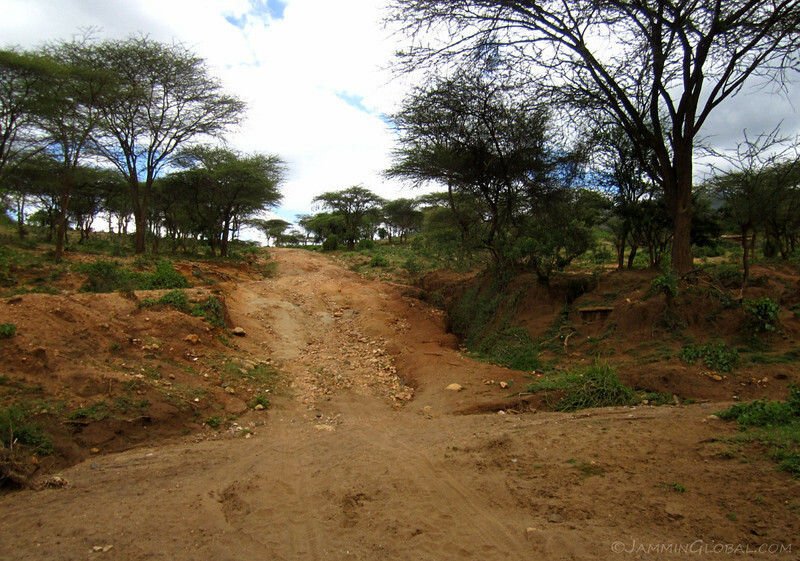 Summiting a path after a steep climb up a narrow road that was leaning away from the mountains with many rain ruts. 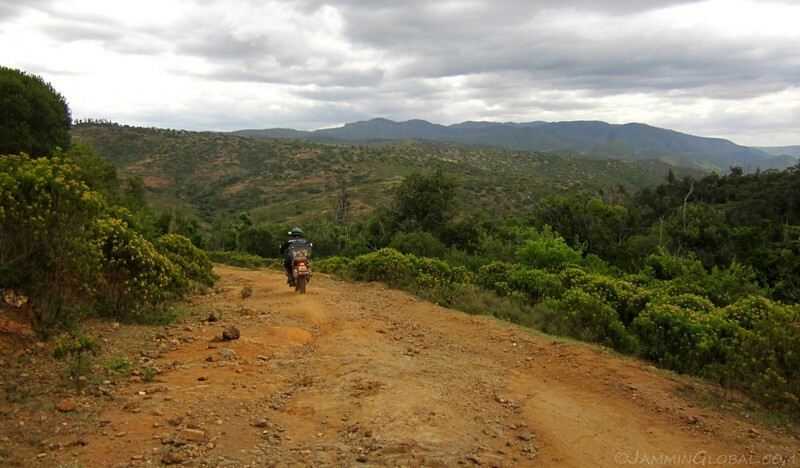 A Suzuki DR650 and a KTM 640 enjoying the offroad in the mountains of northern Kenya. 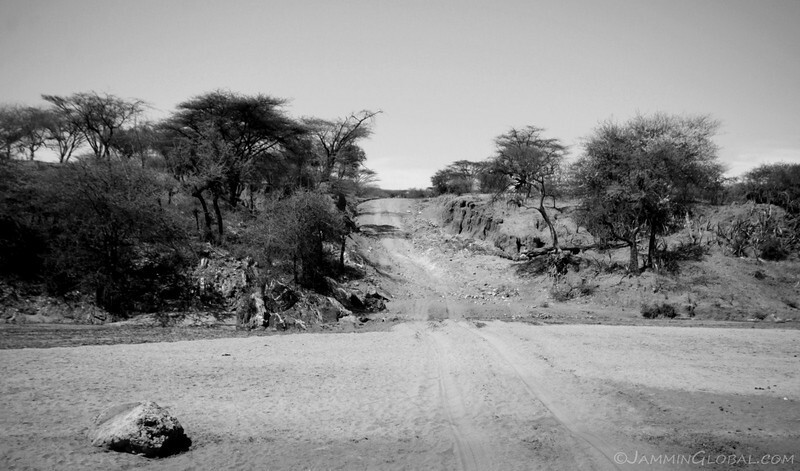 Almost done with all the serious offroading and just a few more kilometers to Maralal. As we rode into Maralal, Carlos and I high-fived each other. We made it. 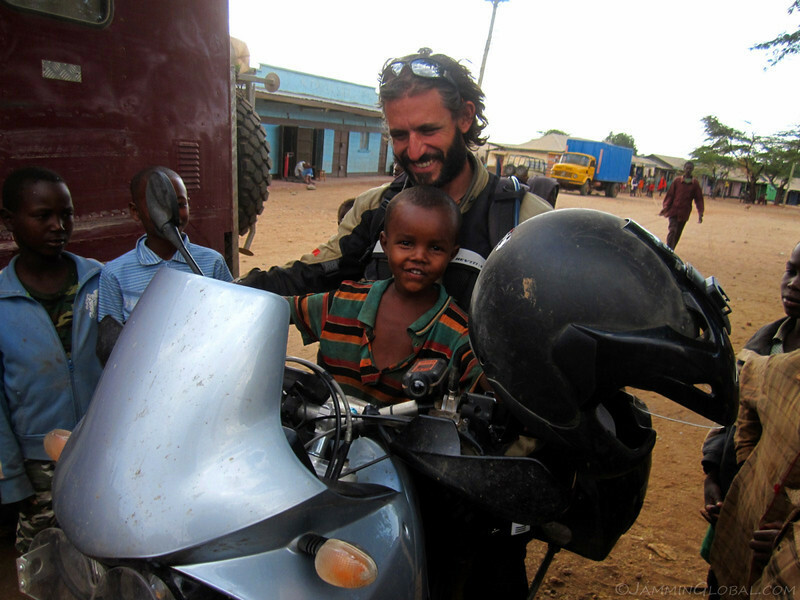 We rode the infamous Lake Turkana route and not only survived it but thoroughly enjoyed it. All that sand and those sharp rocks definitely raised my tension at times but by the end of it, I was comfortable again riding in deep sand and don’t fret sharp rocks anymore. I was glad to have Carlos for riding company and as bikers know, if you want to improve your riding ability, it’s best to ride with someone who’s more skilled than you because it will encourage you to push your envelope, which I certainly did on this ride. Pushing your limits means crossing your limits and my fall in the rocks brought me back into my comfort zone but that was now much further out than before this ride. 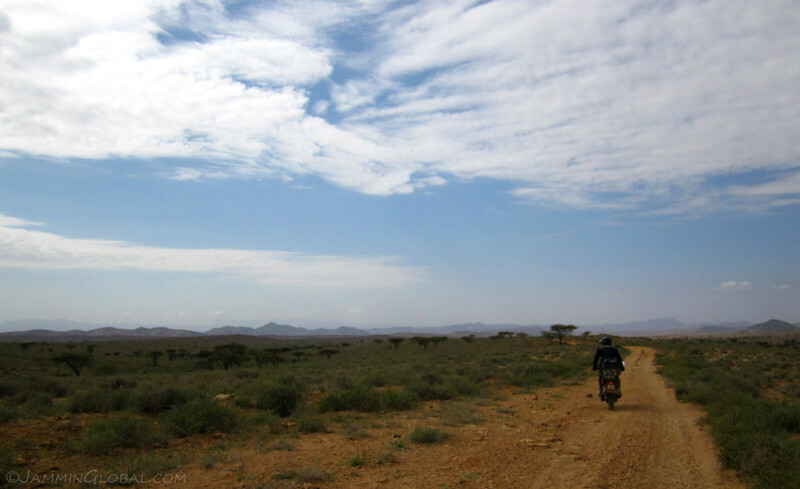 The Lake Turkana route is one of those epic rides that should feature in every adventure biker’s dreams at night. 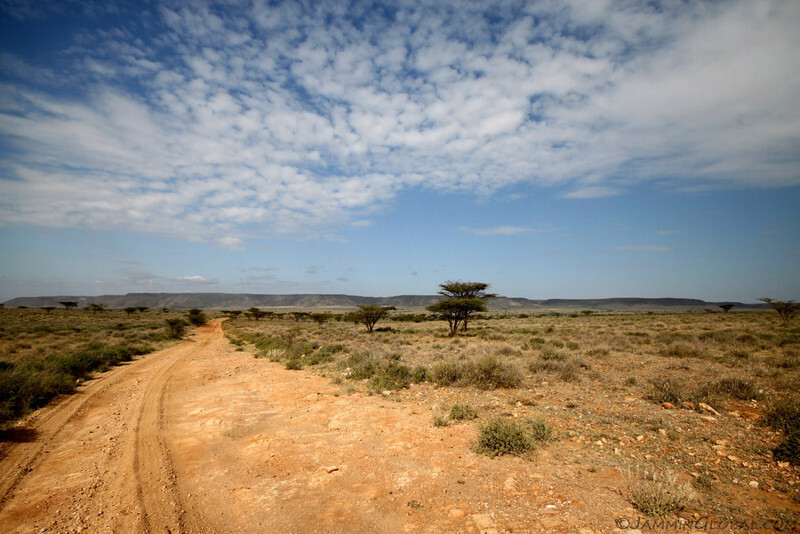 The route went across deserts, featuring deep sand and sharp volcanic rocks, through savannah and finally up into mountains. 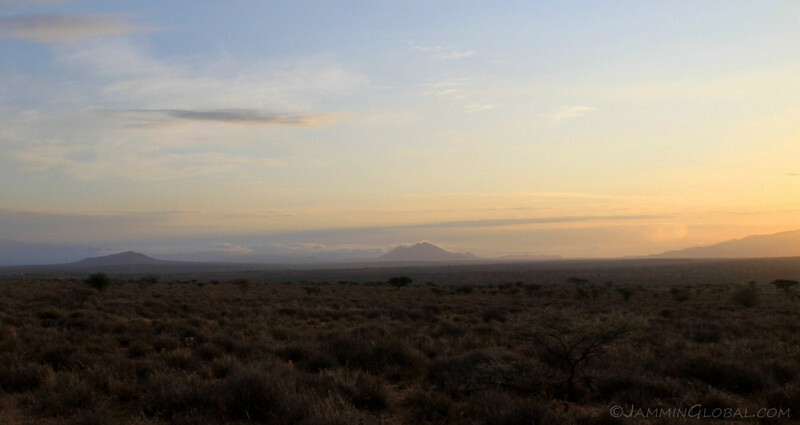 The tough terrain ensures that this wilderness will remain as so for years to come and it truly captures what wilderness in Africa is all about, or at least what I dreamt it was all about and my dreams came true. While the 640 is a great bike. 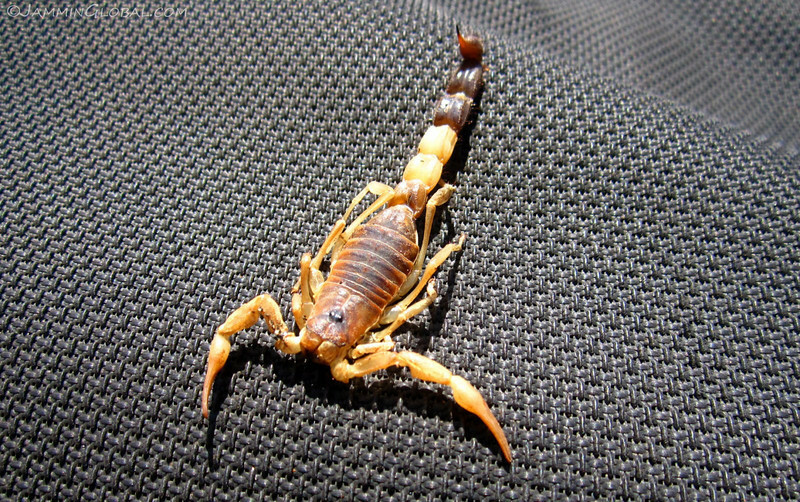 I would prefer your choice of a practical Japanese thumper on a trip like this.